James Guo, right, and a student show off the da qiang weapon. Photo by Amir Aziz. The two men face each other. One master. One student. Each holds a three-metre spear. They drop into fighting stances. Their sneakers skim the studio’s wooden floors. The spears swim in tight circles, looking for an opening. The master’s eyes narrow. The student’s stance shifts. They thrust. The spear—a modern replica with a rubber tip—thuds against the student’s chest. The whistle inside the spear tip squeals. Three points for James Guo. There’s a new sport starting in Toronto, developed entirely in the city, but based on 3,000 years of Chinese military history. The sport is called da qiang. Da qiang echoes fencing, but instead of swords, players fight with replicas of ancient Chinese spears. Da qiang takes its name from the da qiang weapon, which is a spear ranging in length from three to five metres, and was a staple of the ancient Chinese battlefield: the mainstay of Chinese armies for centuries. 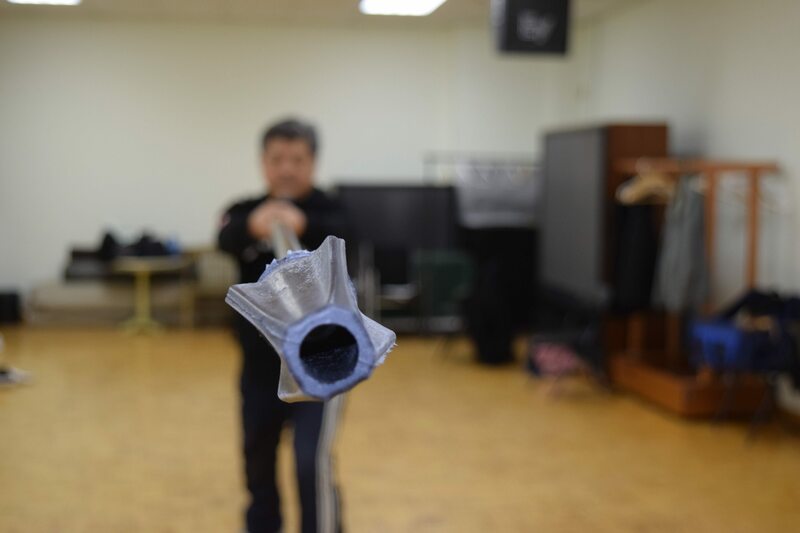 The man behind the sport is Guo—a retired engineer, a scholar of ancient Chinese armaments, and a kung fu master with 50 years of experience. Guo has taught kung fu in Toronto since emigrating in 1979. Guo’s interest in the da qiang spear began in his youth in Taiwan. When Guo learned kung fu under his teacher, Liu Yun Qiao, the da qiang was a relic no longer practiced within the mainstream kung fu schools. The da qiang had been replaced in traditional kung fu styles by shorter and lighter spears. But that hadn’t stopped Liu from thinking about the weapon. “Sometimes he’d bring a book,” Guo says. “A famous book called the Record of Arms.” The Record of Arms, a famous Chinese military text from the 1600s, discusses classical weapons including the da qiang. Guo’s curiosity in the da qiang grew. He left Taiwan in 1976 to study electrical engineering in the United States, carrying a copy of the Record of Arms with him. Until 2007, when he earned a PhD from Shanghai Athletics University with his thesis on the Ming Dynasty Military Da Qiang, the book was Guo’s constant companion. “I had the book with me, 24/7.” After finally earning his PhD, Guo was confident that he understood the text and the da qiang enough to focus on promoting his sport, and he returned the Record of Arms to his bookshelf. Guo wanted to “crack” the combative techniques hidden in the manual’s illustrations. He moved to Toronto in 1979, worked as an engineer during the day, and taught martial arts in his free time. He learned carpentry to make his own spears, topped them with bicycle handles for tips, and experimented with his students on how these techniques could work against live opponents. As his students and martial arts colleagues grew interested in competition, Guo realized the potential for a fully realized sport. As an engineer, Guo was used to solving complex technical problems. He used that mindset when creating the sport. Guo started with the equipment: boxing had gloves, fencing had jackets, and Guo needed a convenient, safe-to-use da qiang. 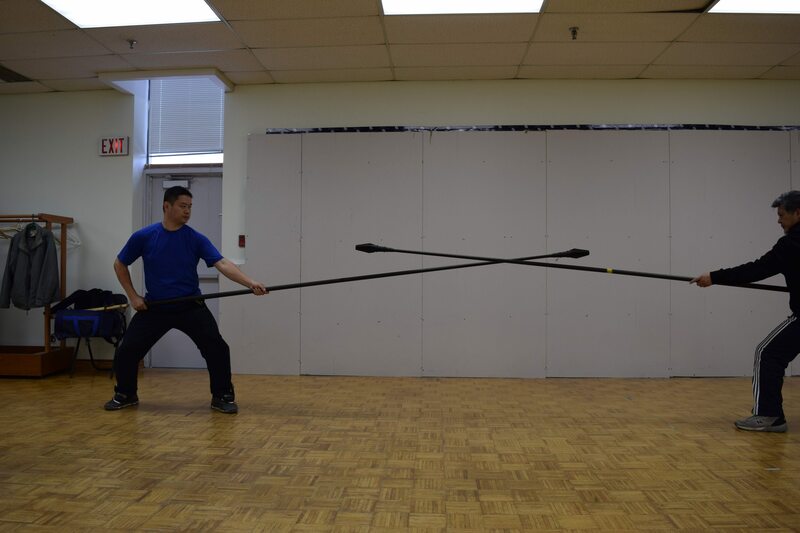 Student and master face-off using da qiang lances. Photo by Amir Aziz. The first issue Guo tackled was the spear length: his early handmade spears were made from single pieces of three-metre pine. The pine spears were almost impossible to transport from place to place. Guo designed carbon-fibre spear shafts that could unscrew into two easy-to-carry pieces. The spear tip presented a new problem: the tip had to register a proper hit, without hurting the player. Guo developed a foam-and-rubber tip with a whistle inside. When struck with a dead-on thrust, the whistle would squeak, letting players know that the hit had landed. The design purposely gave no whistle for a slash, which wouldn’t have hurt armoured soldiers. Adding hockey helmets and chest protectors modelled on Han dynasty armour made the sport safe enough for regular play. While he developed the sport, Guo also attracted students, drawn to the uniqueness of da qiang and the lessons it offered. 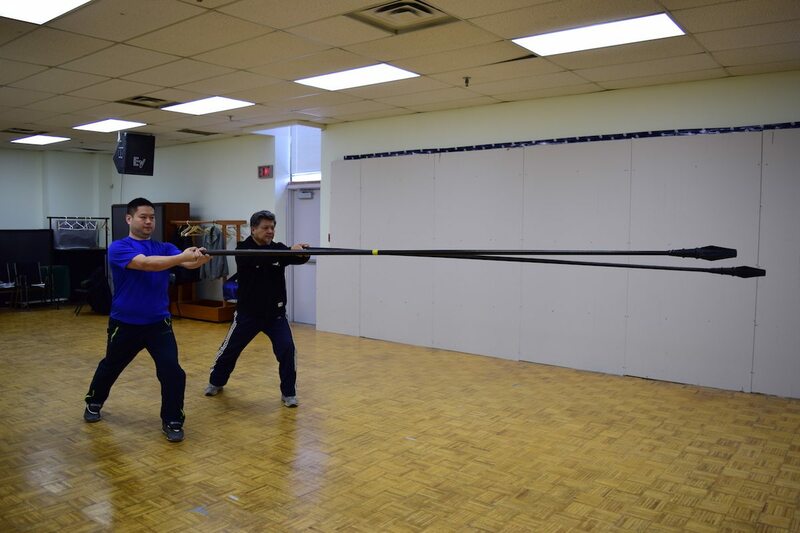 James Guo holding a da qiang lance he developed. Photo by Amir Aziz. Da qiang bouts use a simple points system: thrusts hitting the chest or head get three points, hits to the arms and legs get one point. Guo balanced the point system to reward serious blows and discourage cheap shots to the hands or feet. The first player in a da qiang bout to 11 points wins. While he has taught his own students, Guo wants the sport to spread wider, with players setting up teams and tournaments independently. Participating in the da qiang community requires attending an introductory class with Guo to learn about the equipment and scoring system, but after that players are encouraged to connect to each other, form their own clubs, and organize local tournaments on their own initiative. As da qiang players such as Wei form teams, Guo eventually hopes to create an online community, where people can post videos of their fights and be ranked by a rotating shift of judges. Guo hopes he can build sponsorships and have the strongest fighters come to Toronto to compete. This competition, Guo believes, is what will bring out the best development for da qiang—forging better techniques and better players. UPDATE AUGUST 26, 2017 2:17 PM: This article has been updated to better reflect the state of da qiang practice before Guo started learning.